Great fun learning with Bees! Reading activities, math activities, games, and a craft for your preschool of Kindergarten BEE THEME! 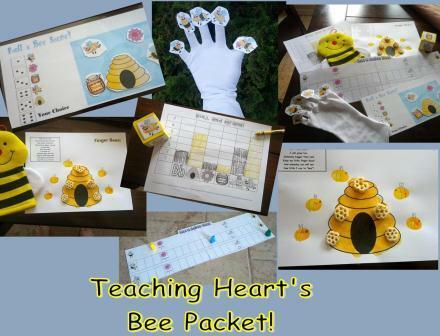 A Bee Themed Packet to use in your Preschool or Kindergarten Classroom. Math and Reading activities included. Craft activity and Pocket Chart pieces are also part of this set! It is quite a value for all you get!!! Please see the preview for more pictures. Also check out the index below for a detail of each page! Page 5—Printables to make a Bee Finger-puppet glove to go along with the five bees poem included. Page 6—Simple Bee Glyph to Color and Take Home. Page 8-9 —Bee counting puzzle. Give page 6 to the student already cut up. They glue the pieces to page 7 and color. Page 10 —Roll a Bee Scene. Print a few copies, Laminate, and cut out five bee pieces. Supply a dice and 1 playing board and set of pieces per player. First player to get all their pieces onto the blue backdrop wins. Page 11-15—Counting Game—Students work together to finish a puzzle. They collect Bees along the way. Game stops when puzzle is completed. Count the bees to find a winner. Directions included. Page 20—22—Two dice cover-up games. Page 23-24—Dice Graph—printables to make a graph. Student rolls until one column is filled. Page 25—Bee Phonics Activity Sheet— rhymes with Bee, beginning sounds, and trace b’s. Page 26, 27, 28, 29 —Craft idea—Finger Bee Craft and Poem to Match. Beehive Printable to use with craft. Page 29 is just a ready to print version. All you do is add the fingerprints. Page 30—Count By Fives Puzzle—Print, laminate, cut. Students put the puzzle pieces together. Use as a center activity. Page 31—35—Bee Pocket Chart Poem. I read the poem and call on someone to match the picture to the text. Click here to visit Teaching Heart and Click Here to Visit Teaching Heart Blog!